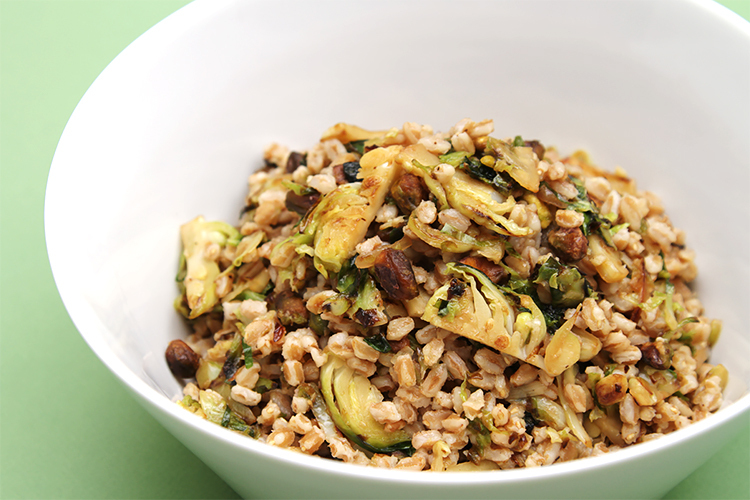 Farro with pan-roasted Brussels sprouts & pistachios A super-delicious & healthy farro side dish – the Brussels burst with flavor! 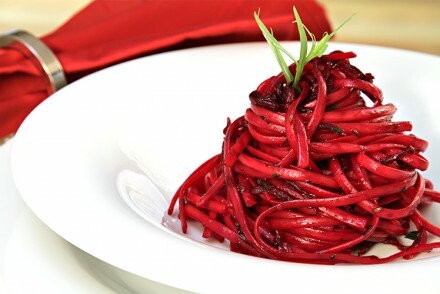 Here’s a dish that’s as healthy as it is scrumptious! 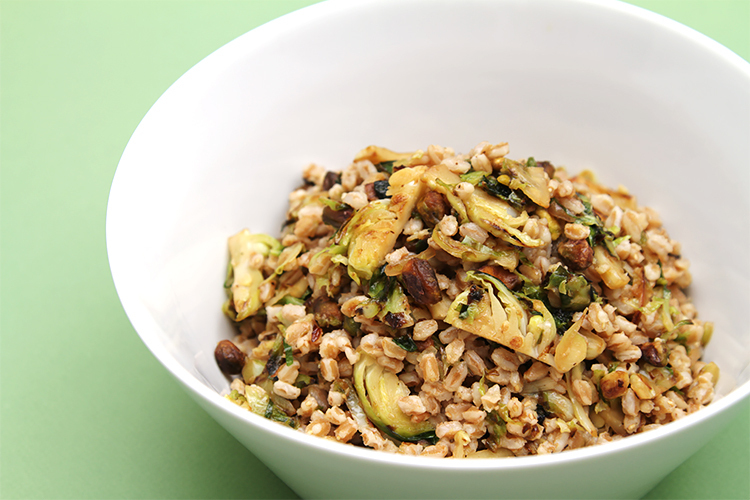 Brussels sprouts are pan-roasted until they become deeply flavorful and sweet, then tossed with crunchy salted pistachios and deliciously earthy farro. Every bite of this dish is a joy. 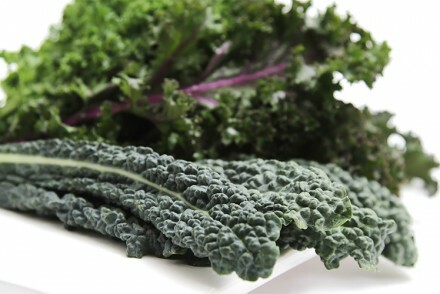 Serve as a side or as part of a light main course. It’s an easy part of any weekday meal! 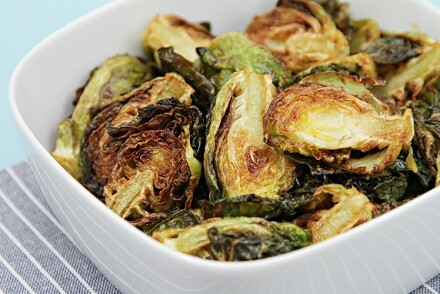 Of course, this recipe makes for a perfect side dish with meats or poultry. But for a light main course, serve it with a couple of other sides – like this sautéed Swiss chard with lemon zest and these luxurious mashed potatoes with garlic confit. If serving this dish as a main course, then pour a full-bodied, aromatic white wine like a Chasselas or Pinot Blanc from Alsace, a Viognier from Southern France or California, or a Neuburger from Austria. The latter, a lesser-known varietal, is lush and has nutty notes that pair wonderfully with the pistachios. Step 1: Place the water in a medium heavy-bottomed pot and bring to a boil. Add the salt, garlic, bay leaf and grains. 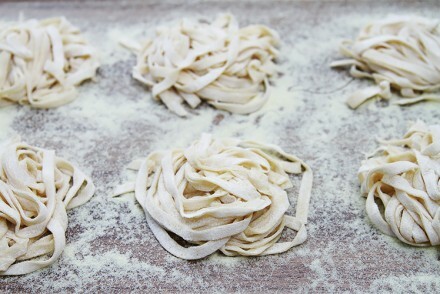 Reduce heat to medium and simmer uncovered for 30 minutes, until tender but still al dente. Drain well, remove the garlic and bay leaf and reserve 1/4 cup of the cooking liquid. Step 2: Heat a large non-stick skillet over medium-high heat. Add the butter. As soon as the butter has melted, add the olive oil and syrup. Stir well and add the Brussels sprouts. Sauté for 6 to 7 minutes until golden-brown, stirring only from time to time. Add the shallots and sauté for 2 more minutes until softened. Add the garlic, salt and pepper and sauté for an additional 30 seconds until the garlic has released its flavor, but don’t let it brown. Add the pistachios, farro and reserved cooking liquid. Toss well and sauté for a few seconds only. Transfer to a serving bowl and serve immediately. Made and used oils from frying maple bacon earlier in the day instead of olive oil. Was delicious! 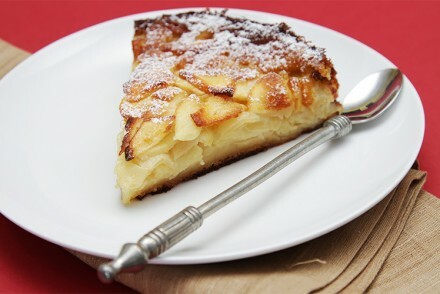 I am delighted you enjoyed this recipe, Barbora! I make it very often in the winter months and never tire of it. I hope you get to enjoy it often too. Thank you for your note! This was delicious, perfect with a roasted chicken… and the Tuscan apple cake for dessert. Only thing better was re-living it all the next day. Coffee with slice of cold cake for breakfast (heaven), leftover farro with a poached egg on top for lunch. Really REALLY good. Thank you. Ooooh… I am so thrilled you enjoyed this recipe AND the Tuscan apple cake! I must say they are two of my all-time favorite recipes. Thank you so much for your note. I am most grateful to you for taking the time to write. Happy cooking… and eating! 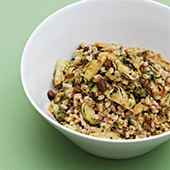 I love everything about this gorgeous farro dish! 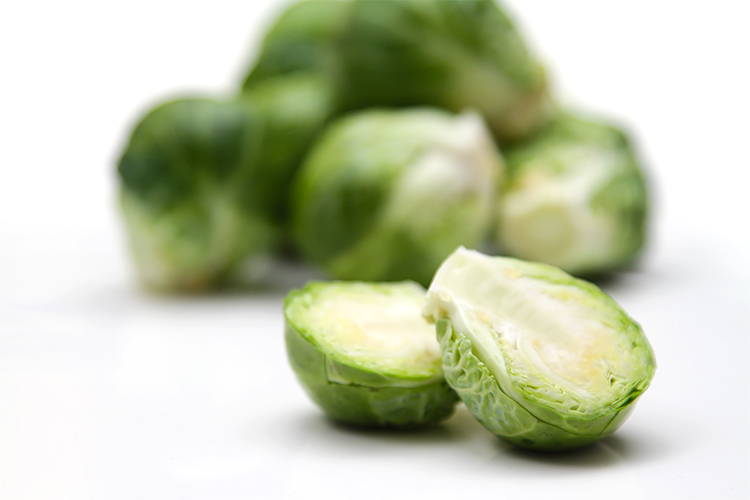 I need to pick up some Brussels sprouts and make it ASAP. Liz! 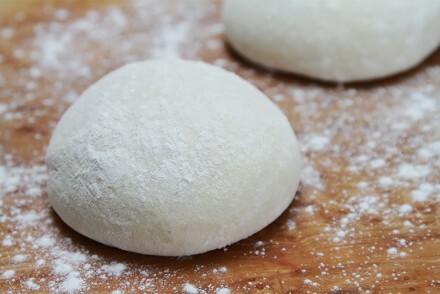 You’re so wonderful… I must admit that I make it quite often and haven’t tired of it yet! Enjoy! Brussels sprouts and pistachios are a really cool combination, would not have thought of it. 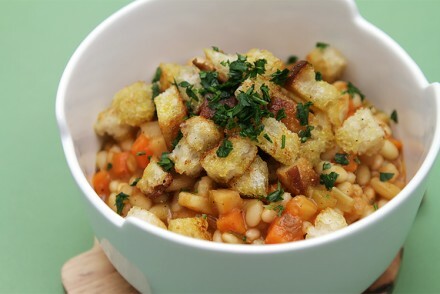 Looks like a great dish, got to get me hands on some farro soon. A wholesome fall salad! 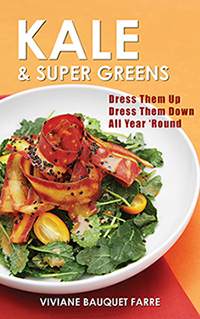 I made a similar salad last year, so I know this taste wonderful. Have a wonderful weekend, Viviane!